Let me tell you something about me, deprivation and I really don’t get along. In my never-ending quest to eat well whilst being mindful of both the environment and my budget, I am constantly devising new ways of cooking so I don’t feel as though I’m missing out on anything. I have somewhat champagne tastes, however, am on a beer budget, so it gets me rather excited to find ways to eat like a king yet spend very little. In my journey along this mortal coil, life has taught me that if you really want something, you can figure out a way to achieve it through resourcefulness and use of imagination. The emphasis on this year’s World Environment Day is the topic of food waste and what can be done about it. Unfortunately, even though I find the greater majority of people around me (particularly the ones I work with) to have no interest in this issue, there are a small percentage who actually do care and are proactive about it. We collect food, distribute it to charities, give it away to neighbours and use a little of it to feed ourselves. Anything, just to keep it out of landfill. This week’s post is about creating rich, satisfying and beautiful food with all the above in mind. As much as most of us would love to be regularly supping on foie gras, truffle butter and fillet mignon, we just can’t. For example I love meat, but I don’t love meat enough to eat it with reckless abandon it every day and for every meal. The unnecessary animal slaughter and subsequent impact on the environment are just too great for me to indulge my love for animal flesh when there are just so many other things I can eat in their place with equal nourishment. So therefore I try to make the meat I buy go a long way by padding it out with lots of vegetables and healthy grains. Since winter is upon us in Australia I thought it to be appropriate to celebrate a season of eating comforting slow-cooked food. The inspiration for this curry was my Sneaky Hidden Veg Lasagne where I make half a kilo (a pound) of mince meat go a very long way by combining it with puréed vegetables. 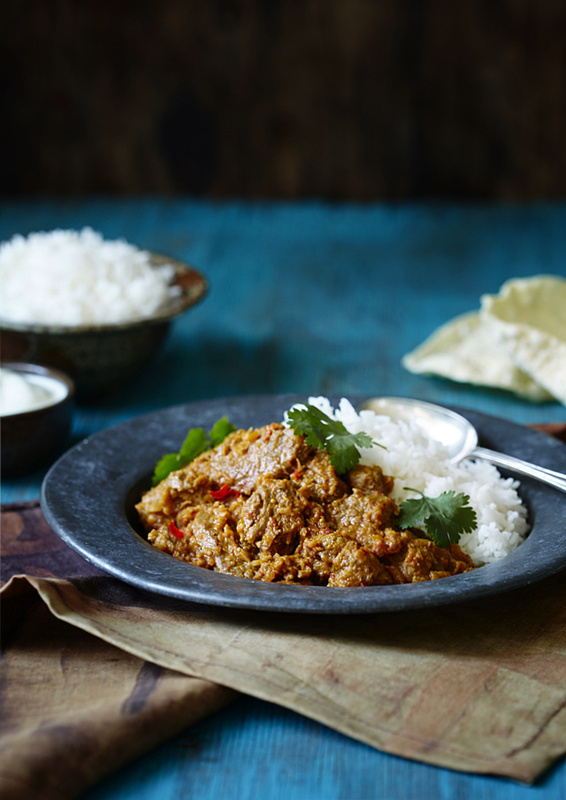 In this curry recipe I combine onions with ginger, chillies and traditional aromatic spices used in Indian cooking with a vegetable purée to make a curry paste. I then add diced beef (or lamb) and slow cook it in the oven for around two and a half hours. The end result yields a dish with a thick delicious sauce and much substance and comfort, especially when teamed with steamed basmati rice and some crunchy pappadums. I always make this curry with two mild-flavoured vegetables for the puree, an orange-coloured vegetable like pumpkin, sweet potato or carrots and a light-coloured vegetable to balance it out like a zucchini or silverbeet stems. The first time I made this I used carrots and leftover silverbeet stems after having made my Greek-Style Silverbeet and Leek Frittata with the leaves. I’ve also gone on to use zucchini and pumpkin, however I always use at least one small carrot in the mix. What I love about it (aside from it being so gratifying), is that it goes to show that you don’t always need to use a lot of meat in your cooking. This is something to celebrate, and best of all, you don’t miss out on anything. With this recipes like this no one need ever feel deprived, especially when the curry tastes as good as it does. When you think about the food you are consuming with awareness you start to think beyond the supermarket shelf from which it came. You eat with conscience, and in return you save on so many levels. You save money, you save yet another animal from slaughter, you save resources from being used unnecessarily, you save further impact on our beautiful planet, and the list goes on and on. In an ideal world we would transport food Star-Trek style to other parts of the planet that need it, but unfortunately we can’t. We can however buy less, waste less and eat less which, little by little will add up and help create change. It may seem like a drop in the ocean, but remember that an ocean is made up of countless little drops that make up a whole, and every little drop can make a difference. Serves 6. Prep time 40 mins, cooking time 3 hours. Preheat oven to 150˚C (300˚F). 1. In the bowl of a food processor place the onions, garlic, ginger, chillies, coriander roots, silverbeet stems and carrots and process until just short of a puree. This will be your curry paste, put aside. 2. Place the ghee or olive oil in a heavy based casserole pan (such as a Le Creuset) over medium to high heat, add the paste and cook until aromatic. It needs to change colour and become a little dry (about ten minutes). 3. Add a little more ghee or water to the pan and add the garam masala, turmeric, mustard seeds and cumin, and fry until the spices become aromatic and the mustard seeds start popping. Cook the spice paste for a further ten minutes. 4. Add the meat and bay leaves and cook until meat is browned. Add the tinned tomatoes, stir through and cook a further few minutes. Add the coconut milk to the pan, stir through, turn the heat up and bring curry to a boil. Turn the heat down, simmer for five minutes, put the lid on and place in oven for around 2.5 hours. You can take the lid off for the last half hour if you would like to reduce the sauce a little and give it a bit more of a roasted flavour. * to make a simple yet delicious accompaniment to your curry, finely dice two small to medium sized cucumbers and in a separate bowl whisk together ¾ cup plain Greek yoghurt, ¼ teaspoon sugar or sweetener of your choice, ½ teaspoon toasted cumin seeds and salt to taste. Mix the yoghurt dressing with the cucumber and top with ¼ cup finely chopped fresh coriander. I adore antique pewter and the plate I used in this image dates back to the mid 1800’s and was found at the Salvo’s. The surface is an old weathered piece of veneered timber I found in my neighbour’s yard and painted turquoise. The background is a top of an old coffee table found in a local hard rubbish council clean up. I made the napkin out of a piece of waxed canvas I also found in hard rubbish and the little bowls and cutlery are from local op-shops. The only light used in this image is window light shot late in the day. I love beef curry, or anything curry! Great post!